The Oregon Conservation Strategy identifies priority Strategy Species and Strategy Habitats. These Strategy Species and Habitats should be monitored over time to determine their status and the effectiveness of applied conservation actions. Detailed guidance for monitoring is available and summarized for some Strategy Species and Strategy Habitats. Investments in conservation should be strategic, effective, and accountable. Success of these investments can be measured by: (1) assessing existing conditions, (2) identifying desired conditions, and (3) measuring change over time. A well-designed monitoring program takes an adaptive management approach using verifiable and reliable science. Monitoring objectives should be simple, easily communicated, and relevant to people’s concerns. Data and information derived from monitoring should be easily understood, well-documented, and accessible in a variety of formats for relevant audiences (e.g., scientists, public and private land managers, policy makers). Specific methodologies for monitoring and reporting monitoring results allow grant administrators and other funders to track specific progress and investment value of projects they have funded. This is especially helpful when tracking investments and projects that occur over wide areas and long periods of time. Monitoring of conservation efforts or management actions should be funded along with any project implementation. Further, natural resource professionals should seek collaborative ways to make monitoring affordable, relevant, and easily accessible. Monitoring results should be shared with peers, policy makers, and local decision-makers to the extent possible, allowing people to learn about successes and adapt actions and policies more efficiently and strategically. Photo Credit: Keith Kohl, ODFW. Western Pond Turtles. It is not possible to monitor all species of potential conservation concern. Natural resource managers must consider the conservation goals and make reasoned, strategic decisions about monitoring needs. Priority is often placed on species or habitats in decline (Strategy Species and Habitats), or on locations that will potentially have the greatest impact to a number of conservation priorities simultaneously (Conservation Opportunity Areas). Monitoring may occur at different scales: site, stream, watershed, ecoregion, and statewide. While different questions may be addressed and different variables measured at each scale, a monitoring plan should focus data collection on a clearly-defined purpose. Monitoring should be directed at the same scale that the conservation action or limiting factor is occurring. Results from local, site-specific monitoring projects should be incorporated into statewide, regional, national, and even international monitoring projects to allow for examination of larger-scale population or ecological trends. Project goals should outline what will be monitored, the appropriate monitoring approach, and for how long. Monitoring may be directed toward individual species or species groups, habitat conditions, ecological function, or ecological integrity. Specific limiting factors (e.g., the degree of contami­nants in fish found in the lower Columbia River). Photo Credit: Brian Wolfer, ODFW. One way to record the presence of Strategy Species is to use trail cameras that automatically take a picture when they sense movement. In this example, a Fisher was recorded near the upper Middle Fork Willamette River drainage area, in the Willamette National Forest. Conservation Strategy monitoring can focus on (1) species, sometimes called the “fine filter for conservation planning” or (2) habitats or other environmental measurements, sometimes called the “coarse filter for conservation planning”. Specific examples are described below. Strategy Species Determine the current presence and distribution of species as well as demographic information, such as population status and/or trends. The Oregon Biodiversity Information Center maintains observation and occurrence records for species with conservation status. The Breeding Bird Survey monitors status and trends of North American bird populations. Working with the Oregon Department of Fish and Wildlife and other partners, the Klamath Bird Observatory developed a Species Monitoring Portfolio to support Strategy monitoring. Surrogate Species Surrogate species are intended to represent a suite of species or a particular habitat type. Monitoring a surrogate species provides information that can then be used to infer trends or conditions of multiple species. Surrogate species are not necessarily “common” species. The U.S. Fish and Wildlife Service Surrogate Species Initiative is identifying surrogate species for each Strategy Habitat in every ecoregion across Oregon. Aquatic and Watershed Monitoring Helps ensure good water quality and healthy watersheds, which are essential for many species and ecological functions. The National Fish Habitat Action Plan provides a national framework for assessing aquatic habitat quality. The Oregon Watershed Restoration Inventory tracks voluntary efforts to restore watersheds for salmon and wildlife. Strategy Species pages provide information on species-specific survey efforts and monitoring guidance documents. In Oregon, Scientific Taking Permits are required by the Oregon Department of Fish and Wildlife (ODFW) when fish or wildlife will be captured or handled for scientific purposes. Depending on the species, federal permits may be required as well. Measuring and Monitoring Biological Diversity: Standard Methods for Mammals. F.R. Wilson, J.D. Nichols, R. Rudran, and M.S. Foster, editors. Smithsonian Institution Press, Washington, DC. Pp. 115-155. Partners for Amphibian & Reptile Conservation: Inventory and Monitoring: Recommended Techniques for Reptiles and Amphibians, with Application to the United States and Canada. G.J. Graeter, K.A. Buhlmann, L.R. Wilkinson, and J.W. Gibbons, editors. Sampling Methods for Terrestrial Amphibians and Reptiles. 1990. USDA Gen. Tech. Report PNW-GTR-256. Sampling Amphibians in Lentic Habitats. 1997. Northwest Fauna No. 4: Society for Northwestern Vertebrate Biology. Measuring and Monitoring Biological Diversity: Standard Methods for Amphibians. 1994. W.R. Heyer, M.A. Donnelly, R.W. McDiarmid, L.C. Hayek, and M.S. Foster. Smithsonian Institution Press, Washington, DC. Western Pond Turtle: Biology, Sampling Techniques, Inventory and Monitoring, Conservation, and Management. 2012. Northwest Fauna No. 7. Society for Northwestern Vertebrate Biology. The ODFW monitors fish species and their habitat across the state. The ODFW Corvallis Research Laboratory website has a variety of project-specific information, including protocols, guidance (habitat), reports and publications, and data. Additional data are available through the ODFW Data Clearinghouse. The ODFW Salmon and Steelhead Recovery Tracker website provides information on the health of Oregon’s anadromous salmon and steelhead populations. Website users can explore and download information related to salmon conservation and recovery in Oregon, including metadata explaining how data were collected and analyzed. Pacific Northwest Aquatic Monitoring Partnership (PNAMP) gathers information and resources on monitoring of fish, habitat, and water quality. PNAMP’s Resources page provides a network of information and tools to support many facets of ecological and biological monitoring, including orientation and educational materials, a community forum, a place to document and share monitoring methods, the ability to describe monitoring projects and upload sample sites, and tools for creating sample designs. The U.S. Forest Service’s (USFS) Interagency Special Status and Sensitive Species Program lists references for inventory and monitoring protocols for many sensitive species, including butterflies and moths, snails and slugs, amphibians, birds, bats, plants, and fungi. The Oregon Plan for Salmon and Watersheds monitoring program provides technical assistance manuals produced by the Oregon Watershed Enhancement Board (OWEB) and manuals developed by the Oregon Department of Environmental Quality to guide water quality monitoring. These are good sources for launching monitoring programs and for guidance on effectiveness monitoring. Photo Credit: Kathy Munsel, ODFW. Members of the public bird watch at Ladd Marsh Birdathon. Citizen-based monitoring can greatly expand our ability to collect data. Through citizen science, Oregonians contribute valuable local biological knowledge. For example, birdwatchers and anglers understand the distribution and behavior of their favorite species, and farmers and other landowners have deep familiarity with what occurs on their land. Citizen-based monitoring can tap into this knowledge, increase the amount of data that can be collected, and reduce the overall costs of data collection. Citizen-based monitoring also engages Oregonians to take an active part in conservation, teaching people about their local environment, and providing a forum for feedback and discussions related to conservation actions currently underway on their land or in their neighborhood. By supporting and building on these efforts, scientists and Oregonians can work together to address monitoring priorities identified in the Strategy. Alliance of Natural Resource Outreach and Service Programs Information on Master Naturalist programs throughout the U.S.
Identifying critical data management needs early in the monitoring project planning phases. Data collection activities should not begin until a proper database design (data dictionary) and data management plan is developed. Identify how progress will be measured (e.g., specific metrics to be used, such as number of acres restored, number of stream miles improved, or number of landowners given technical assistance). Implement consistent procedures for data entry so that progress reporting can be done through queries to a database. Where possible, develop tools to automate the reporting process. Design web-based data tools to ensure consistent data entry by multiple partners, maintain data integrity, and improve data sharing. Use monitoring results to determine the conservation outcomes of a project and to identify adaptive management strategies. Natural resource managers must continuously learn from their efforts to restore habitat and implement conservation actions. Management of projects and funds can then be adapted based on new information and/or changing conditions. However, adaptive management is not just trial and error. It is a process that adjusts active management by determining which actions work, and analyzing why they succeed or fail. Steps include: Assess – Plan – Implement – Monitor – Learn – Adapt – Repeat, and more information is available through the USGS Adaptive Management Guide. Effectiveness monitoring is designed to determine if the project is effective at meeting its biological and ecological objectives. More information on effectiveness monitoring is available through the OWEB’s Effectiveness Monitoring page. Species or habitat variables should be monitored over time to determine project effectiveness. Adaptive management approaches should be used if new approaches are needed to meet project goals. Providing mapped locations of conservation projects allows land managers to allocate resources more efficiently and reduce duplication of efforts. Over time, tracking projects on the ground allows managers to evaluate the cumulative progress towards conservation goals for Strategy Species and Strategy Habitats. Conservation Registry Landscape-scale conservation project mapping tool. Tracks and maps conservation, restoration, and wildlife projects across the U.S. Developed by Defenders of Wildlife, the Oregon Department of Fish and Wildlife, and other partners to support the Strategy and to facilitate informed decision-making, inspire collaboration, and provide context and effectiveness for conservation work. Wildlife Tracking and Reporting Actions for the Conservation of Species (TRACS) Wildlife TRACS is the tracking and reporting system for conservation and related actions funded by the U.S. Fish and Wildlife Service’s Wildlife and Sport Fish Restoration Program. View project reports or view project locations on an interactive map. Teaming with Wildlife provides information on how other states are using Results Chain Models in State Wildlife Action Plans. Develop performance measures for wildlife management activities. Define project outcomes and show the connection between management actions and conservation outcomes for Species of Greatest Conservation Need (Strategy Species). Remote Greater Sage-Grouse leks (areas where males gather in a mating display for females) are the most important places to monitor this iconic species, but they can also be especially difficult to access by land. 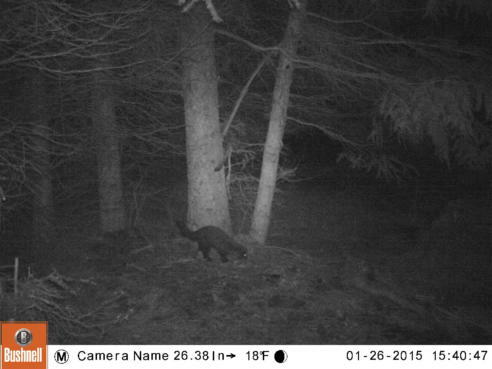 Several leks in eastern Oregon had gone several decades without monitoring, with some leks last surveyed over 20 years ago, and others having gone without a survey since the World War II era. In spring 2015, Oregon Department of Fish and Wildlife (ODFW) biologists began testing the use of infrared technology to remotely detect birds from the air. Airplane-based infrared remote sensors can survey leks that are difficult to visit on the ground for reasons including access or extreme remoteness. ODFW contracted with Owhyee Air Research to conduct the surveys with fixed wing aircraft. “We’re very pleased with the results, and the technology looks promising. We confirmed many leks are still active that haven’t been surveyed for decades because of access issues,” said Jackie Cupples, Statewide Sage-Grouse Coordinator. Male counts are used as the population index, and adding visible light cameras may let biologists distinguish males from females and allow continued monitoring of remote or inaccessible leks. More than 1 million acres of sage-grouse habitat burned in the 2012 wildfires. 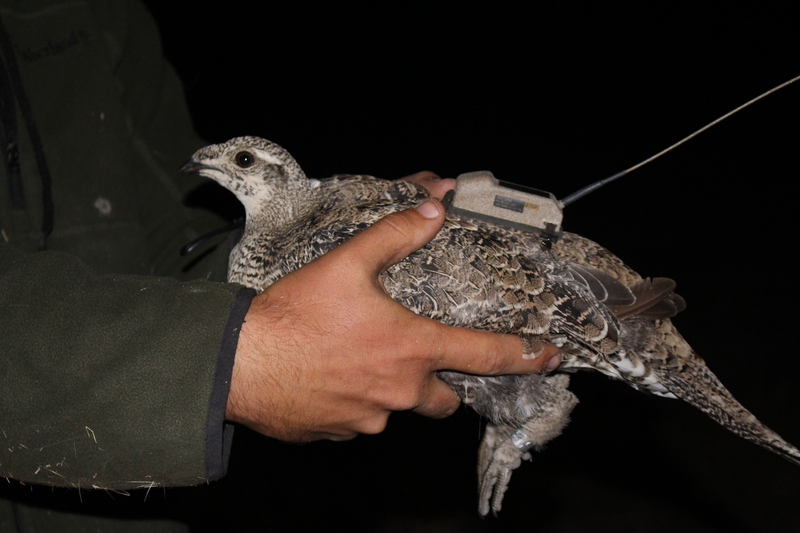 To see how well the birds respond to very large, landscape-altering fires, biologists fixed solar-powered GPS transmitters to 66 sage-grouse hens in 2013 and 2014. Transmitters record up to several point locations daily which biologists can access via any desktop computer with internet access. It would be very expensive to collect similar data with conventional VHF radios that require technicians and biologists on the ground to triangulate locations, especially for birds that may move several miles in a day. The GPS point locations also improve lek location accuracy. The majority of leks are still counted from the ground to get an index of male attendance, but the combination of IR flight and GPS transmitter data is giving biologists more tools to survey leks that are difficult to access. IR flights may also reduce risk to biologists who survey leks from helicopters that fly at low elevations in mountainous terrain. Partnerships are key in conserving sage-grouse, and funding sources help to make these types of research projects happen. The IR flights were funded with a combination of ODFW and Bureau of Land Management funds while ODFW’s Upland Game Bird Program funded the 66 hens equipped with GPS transmitters. Funding from the Oregon Hunters Association and Oregon Wildlife Foundation will, in part, allow the project to continue with a new PhD student, technicians, and more GPS transmitters. Greater Sage-Grouse with solar-powered GPS transmitter.